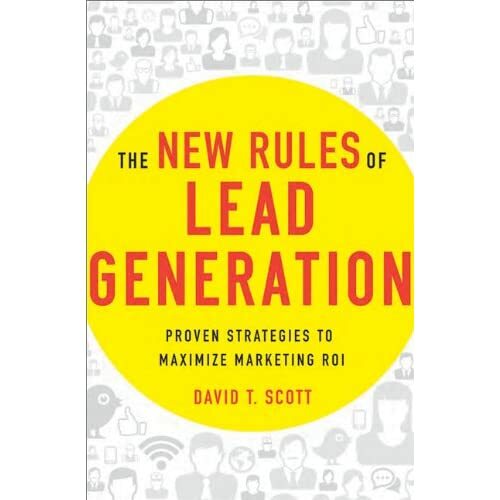 I was fortunate to receive a copy of “The New Rules of Lead Generation“, by David T. Scott, for review. As I read the book I couldn’t help but notice that the author not only goes straight to the point (which is refreshing), he also shows a good deal of experience illustrating each lead generation tactic with clear examples. The author, David T. Scott, is the founder and CEO of Marketfish, a data management and lead generation platform. Prior to Marketfish, David served as VP of Marketing for PeopleSoft and Intermec, and also has Boston Consulting Group and GE in his resume. His solid business background shows that he is not just a “consultant”, “marketing guru” or some “speaker”. But is this book for you? I hope the following review helps you make up your mind. First, I’ve got to say that the title left me a bit uncertain. I have read the other David Scott (the one with Meerman in the middle) book “The New Rules of Marketing and PR” and know that he has started a series of “new rules” books and eBooks. So my first impression was that David T. Scott (or his publisher) was trying to jump on the well known “new rules” title created by another author and take advantage of it. Leaving the issue of the title aside, the book doesn’t focus only on “new” lead generation tactics like social media and online advertising but instead it gives you a more comprehensive roadmap for implementing a lead generation program at your company using both tried-and-true lead gen tactics like direct mail and cold calling and social media advertising, display advertising, and search engine marketing. The book starts off talking about basics of lead generation, how to develop your strategy, and gives an overview of each tactic. The first 5 chapters set up the stage and are great for someone new to marketing or that is interested in getting a better understanding of lead generation. The remaining 11 chapters go deep into each tactic. And he adds a ‘sixth’ step: Repeat! Sounds simple and trivial, but unless you and your marketing organization are in sync as to what needs to get done to setup your lead gen program, it will be tough to get good (and measureable) results. One thing I really liked was that he mentions in several places throughout the book the importance of coordinating your lead generation tactis and testing. He says “You are constantly testing and anlyzing your results to see which lead generation tactic works best for you”. This is important, because you don’t want to go ahead and spend money on certain tactics just because your competitor is doing it or because it is being talked about in the media. Testing is important if you want to improve your lead gen results. There’s one chapter for each of the tactics. Although you won’t get a lot of deep information on the many ways to use a certain tactic, it will get you up to speed on what exactly each one is and how it is used. As I said earlier, this book focuses on the basics of lead generation. Having said that, I think the book is missing a couple of important topics. First, the author presents the reader with the AIDA framework, a model that every marketer should know. It would have been better, however, if he also had introduced the reader to the SiriusDecisions demand waterfall model that is becoming prevalent in larger B2B organizations and a key component in any discussion about lead generation tactics. Another point I think was not stressed enough in the book is the importance of defining what exactly constitutes a lead and how this seemingly simple concept can be the cause for a great divide between sales and marketing, especially because the book is aimed not at the experienced marketer but the beginner. Finally, is not until chapter 5 that the author talks about the marketing and sales funnel, discussing the concepts of Marketing Qualified Lead, Sales Accepted Lead, Sales Qualified Lead, and Sales Qualified Opportunity. I think that it would have been better to have brought up the funnel earlier in the book to set the stage for how different lead generation tactics should help drive and move leads from one stage to another. Regardless of these issues, the book is still a good source of information for those starting off in their marketing careers. For more information about the book, check it out on Amazon and on the book’s website. Some CEO’s just ‘get it’ while others don’t seem to bother. We’re talking about social media, which seems to either be fully embraced by some companies while shunned by others as something that “doesn’t work for us”. If you are trying to get your CEO or company execs to embrace social media the following infographic by MBAOnline.com should help. That is the title of a recent Aberdeen Group report, Publish or Perish: Content Marketing is the New PR, which you can download for free (registration required) here. One of the key insights from the research has to do with how PR has changed in the past few years. While the key mission for Public Relations in most B2B companies is still related to brand recognition and market credibility, the increasing role of content marketing in assisting PR with such efforts is now being seen as critical at most leading companies. The research points to 63% of respondents indicating that content marketing is being used as part of an overall PR strategy at their companies. Companies considered “leaders” are the first ones to understand the importance of integrating content marketing into a broader PR effort, as their report points to 94% of leading companies stating that their PR function is now a component of their integrated marketing communications efforts and showing also that leaders are 50% more likely than followers to indicate that PR has evolved into a content marketing role. If you have been adopting content marketing strategies at your own company, the research results are probably not surprising but rather reinforce the notion that content marketing is here to stay. If your company has a traditional PR department or agency, now is a good time to start re-thinking your public relations strategy and how you approach it with content marketing. To access the report click the image below. You are currently browsing the The Effective Marketer blog archives for April, 2013.